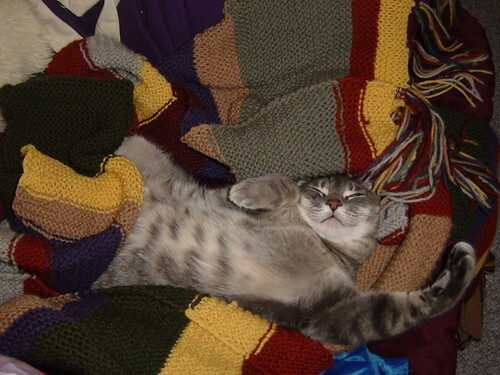 A lot of people find my blog by web searching “doctor who scarf” or some variation thereof. For those who do not have access to the project information on Ravelry, I thought I’d do a post to briefly review it. This is the pattern I used. Yarn: Cascade 220 wool. To choose the colors, I took a print out of the pattern and a picture of the 4th Doctor and selected the colors that matched or were, at least, close. Sadly, the shop where I bought the yarn is now closed, but this OYS (online yarn shop) has “all colors in stock”. I have to admit, this is not a project I would call “fun” or “stimulating” or “enjoyable”. It’s yards and yards garter stitch with random color changes and therefore, numerous ends to be woven in. I really had to force myself to get it finished. However, my husband was very appreciative and the look on his face when he donned the scarf for the first time was well worth the effort of sticking to the project. My final thoughts on the project are here and you can read all my doctor who scarf posts here. Good luck, Doctor Who scarf seekers, and godspeed! Speaking of Doctor Who, stop by tomorrow for a KI special in honor of Saturday’s series 4 premier!